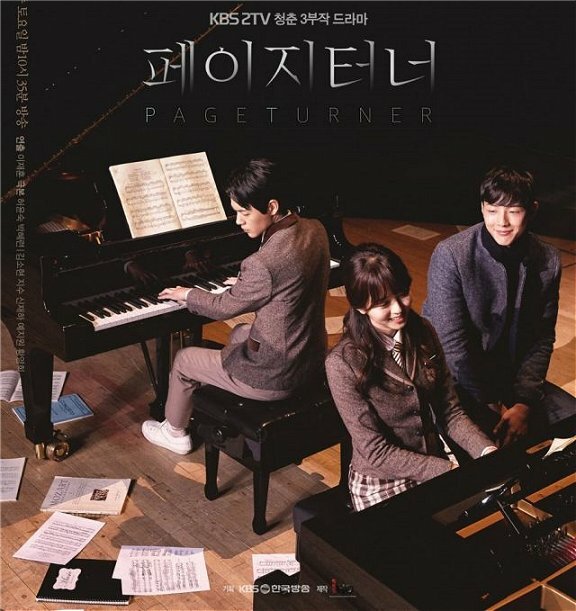 Directed by Lee Jae Hon and with a script written by Park Hye Ryun, this inspiring short Korean drama Page Turner (2016) special brings together three high school aged teens who interconnect with one another after an unexpected car accident leaves a classical pianist student blind. The leading actress is incredibly talented Kim So Hyun, at the time of this drama only sixteen years old, whom I've loved in many dramas (Baker King Kim Tak Gu, I Miss You, The Suspicious Housekeeper, I Hear Your Voice, Birth Secret, The Moon Embracing The Sun, Triangle, Rooftop Prince, Padam Padam, Que Sera Sera, Reset, We All Cry Differently, Goblin, and Ruler: Master Of The Mask, and the recent historical film The Last Princess with Ye Jin Son). I'll basically watch her in anything at this point and Page Turner is a worthy addition to her incredible resume. The actress plays the piano in real life, too, so now we can add classical piano training to all her impressive acting accomplishments as well. The Story: Yoon Yoo Seul (Kim So Hyun) is a genius pianist from childhood and has won many piano competitions, but she is driven by her mother (Ye Ji Won), a frustrated classical pianist and teacher to children, who decides to live through her daughter's brilliant accomplishments. Yoo Seul is not sure she even likes music for herself, but placidly follows her mother's orders like a little automaton. Where is the typical teenage rebellion stage seen in most kids? Nowhere to be found in Yoo Seul! Then fate takes a turn for the worse, Yoo Seul is in a car accident and goes blind from glass thrown into her eyes from the impact. Her rebellion stage against her overly-controlling mother is about to begin! Instead of being a doormat, Yoo Seul becomes feisty about everything, including talking back to her possessive mother. Often in the past Yoo Seul has had to compete against a young man in her school named Seo Jin Mok (Shin Jae Ha). He is technically proficient on the piano but lacks an emotional understanding of music. His father is cold to him and he tries to excel at the piano in a vain attempt to get Dad to notice him. His unhappiness seems to have an indirect effect on Yoo Seul's life: after a confrontation between them after another piano competition in which Jin Mok, acting as page turner for her, knocks her score onto the floor "by mistake" as she plays, she yells at him and insults him. Jin Mok angrily bursts into his church, looks at a crucifix, and cries to Jesus Christ to destroy her! The next day he hears about her car accident and her blindness, and stuffs his own bedroom crucifix into his desk drawer, blaming himself for Yoo Seul's fate. At the same time Yoo Seul suffers her set back and tragedy, a pole vault expert athletic student named Cha Sik (Ji Soo) breaks a national record in his sport, then tries once again to break his own record: on this second attempt an accident happens with the pole and it digs into his body -- right above his crotch! OUCH! His mother (Hwang Young Hee) takes him to a doctor and while advised there is no damage to his reproductive system he still has suffered physical disability elsewhere that precludes him from any more pole vaulting or other sports. He is devastated. Both Yoo Seul and Cha Sik contemplate committing suicide separately by jumping off the school rooftop, but then they meet up after Cha Sik has decided against it and he manages to coax Yoo Seul down. Their conversation is witnessed by the guilt-ridden Jin Mok. Cha Sik volunteers to be Yoo Seul's guide before and after school and they become close friends. Cha Sik is told by his mother that he is the biological son of a famous classical pianist and that gives Cha Sik hope he might have hidden talent in music as well. He begins to teach himself piano and amazingly starts to excel at the instrument. There is a decorative piano sitting outside under a bridge where a street vendor (Oh Gwang Rok) sells his wares. This is where Cha Sik does his practicing, and eventually he brings Yoo Seul there too and they perform duets together. 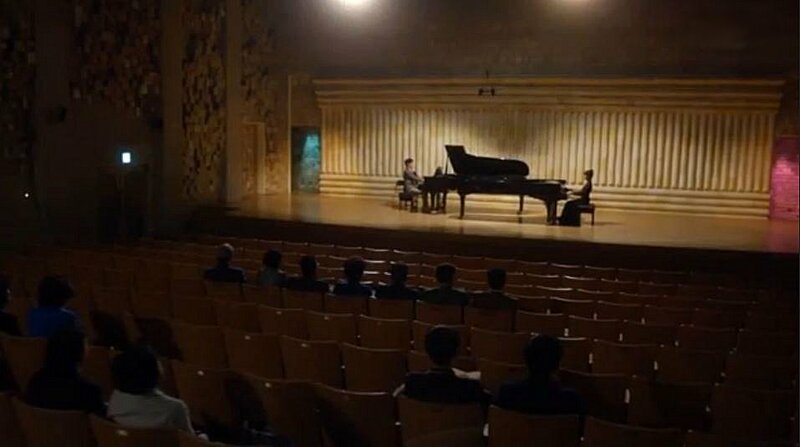 Another important piano competition comes up and Cha Sik convinces Yoo Seul that they should play a two piano rendition of a Beethoven piece; at first reluctantly she agrees -- and then she becomes actually excited about it. Her mother is at first annoyed by her daughter's reliance on this "jock", but then she comes to value him because she finally sees her daughter smiling and enjoying playing the piano for the first time in her life. After Cha Sik's classical pianist father shows up to see his son perform in this competition the young man finds out a devastating fact about him. Will it make Cha Sik freeze up and be unable to play? What role might the guilt-ridden Jin Mok have in helping to heal all their relationships and encourage Cha Sik to succeed, even though it's clear he has become more than a little jealous of Cha Sik and his friendship with his rival Yoo Seul? The ending is quite the surprise, but I feel like the main goal of this story -- to get a shattered blind girl to discover she really loves music after all -- is attained. The music was great in this short drama, from Beethoven to Chopin. For instance the final 2 piano competition showcased Beethoven's 9th Symphony, 4th Movement, arranged by Franz Liszt. Magnificent! Especially if you're a classical music lover, don't miss this drama!